Trans. Daniel Ross, Polity Press, Cambridge, 2016. 280 pp., £17.99 pb. The theoretical foundation of this book rests on the philosophical conflation that Stiegler makes between autonomism and automata. For Stiegler (contra Greek philosophy, Kant and the Frankfurt School, among others), an interpretation of the Greek word for self (αὐτός) leads to an erroneous identification of an automaton with autonomy. That is, reaching a state of autonomy can be the result of a series of automatic functions. Thus, according to Stiegler, the danger is that – in simple words – machines, through the use of algorithmic automatisms, will one day soon become autonomous from the rest of the society and effectively rule over it, automatically and autonomously. That process has already started, as various automatisms are already taking control over our life activities (from stock exchange trading, to traffic lights and transportation flow management, to driverless cars, etc.). I suggest that this theoretical mix-up distorts not only a long tradition of western philosophy, but also misunderstands technological developments. Specifically, I infer that autonomism entails a level of independence, an ability to self-govern by exercising one’s will and logical reasoning. A region becomes autonomous when it shreds the bonds of dependence or servitude to another region, driven by the will and determination of its inhabitants to live free and independently. In contrast, automaticity entails a mere reaction that may not be the outcome of free-will and self-determination. An automatic, knee-jerk reaction, for example, does not require any application of will or reasoning, is not dependent on these and cannot change even if will is applied, until the whole system that produces that automatic reaction is altered or damaged. 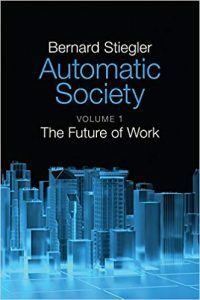 The book though is not titled Autonomist Society: The Future of Work, which would have probably been a more accurate term if the author’s theoretical premises were to be followed. The main theme of the book echoes the age-old fear of machines and broadly speaking of anything mechanical whose functions cannot be, at first, easily understood. Stream engines, robots, computers and in this case algorithms, have all at some point or another been perceived as bringing closer the end of humanity and its enslavement to a (nowadays digital) Beelzebul. For Stiegler, digital technology appears to be synonymous with algorithmic and automated technology, and no distinction is made (nor an understanding of the differences) between automation, machine learning, and Artificial Intelligence. Coupled with the (unfortunate) connection between an “automaton” and “autonomism”, the future can only be bleak. Furthermore, the fundamental motion made by the book is that we need to (we must, as the author emphasises) exit the current phase of Anthropocene (a geological term denoting the exploitative dominance of Anthropos over nature): ‘the escape from the Anthropocene constitutes the global horizon of the theses advanced here. These theses posit as first principle that the time saved by automatization must be invested in new capacities for dis-automatization, that is for the production of negentropy’ (7). Thus, striving for negentropy is the primary proposition made in this book, whose overall goals are ‘to anticipate, describe, alert, but also to propose’ (6). But what is negentropy? The term originates with physicist Schrödinger and denotes the opposite of entropy; that is, the opposite of randomness and the opposite of the natural tendency of living systems to fall into disorder and decay (as the second law of thermodynamics implies). The higher the entropy, the greater the disorder. The opposite of entropy (negentropy) is organisation. Or in really simple words, entropy is death; the fight against entropy is the fight for life itself. But energy needs to be spent to maintain in existence a living system. And arguably the Anthropocene is an era of (ever decreasing) low entropy, where more and more energy, organisation and automation are used and less and less disorder and system decay are allowed to exist. The central issue therefore for mounting a critique towards Stiegler’s work is the understanding that (using the correct terminology for entropy) the transition towards greater automation/digitisation entails more – not less – organisation (more – not less – energy to be spent), and accordingly lower entropy. If we accept Stiegler’s call for striving for negentropy, then more organisation, energy and automation are needed. Dis-automatization – a repeated and favourite call in this book – could only bring us back to the stone age or lead to carnage if, for example, air-traffic control goes back to “manual”. In other words, I fear that fundamental misunderstandings exist in this book. Autonomy, automaton, automaticity (and dis-automatization), entropy and negentropy have fallen victim to an idiosyncratic interpretation by the author. The result is a presentation that relies heavily on neologisms, and the most excessive use of difficult and obscure language. I fear that this is done intentionally to hide that – over the length of several hundreds of pages – this publication tells us really nothing new about the future of work. If I were to strip aside entropy, automation, etc. and approach this book as just one of the many that deal with the future of work under the influence of technological changes, I would indeed find little new. The book begins with the prediction that in a few years’ time unemployment in France will be over 25% as a direct result of technological changes. It is unfortunate, but such a simplistic view has been far too common, especially in past decades, but still holds strong. That is, disruptive technological changes are perceived to lead automatically (to borrow a keyword of the book) to (very) high and (permanent) unemployment and destitution. This is just a bad misconception. Instead, it should be appreciated that when certain jobs become obsolete (even in their thousands), others do take their place and new jobs that cannot even be imagined at present do emerge in the near future. (The entropy of the system stays low – life prevails over death). Likewise, technological change is not a zero-sum game of job creation. With the exception of disaster and bankrupt countries, levels of employment are rising globally. But, record-high levels of employment (practically full-employment levels currently in the UK) are often associated with the rise of precarious jobs and uncertainty. The implications of full-employment coupled with precarious work are not explored fully in this book. This, instead, should have been its starting point. That is, as entropy remains low and life continuous to flourish, and algorithmic self-organisation becomes more common, what does the future of work look like under conditions of near full employment and precarity in developed countries? And what are the implications for the technologically under-developed countries? These are some of the questions I would have liked to see discussed, in easy-to-follow language, without obscurities, and using publications and public discourses not only from France and a handful of other advanced economies, but worldwide. And I would like to see that material organised in a book with a clear and logical structure, where the author gives us an outline of his book and a roadmap of its contents. Finally, I would like to be able to journey into an analysis that does give the reader a glimpse of the future. Insofar as one can bear to keep up, Stiegler’s Automatic Society resembles attempting to drive a car, but only looking though the back mirror; a view of past scenery may be provided but nothing about what lies ahead. The reviewer is clearly correct in his criticism of this book that automation is not identical to autonomy. It is I suppose, its opposite. I learnt much from this review and hence thank the reviewer. There are however, some lesser, side issues that I would like to clarify. But please note that steam engines, robots (automata) and computers are machines, but algorithms are not machines. Algorithms are merely recipes, like in a cooking book. In the latter case, a cook follows the steps given by the recipe and, hopefully, a lovely ginger cake is produced. Likewise, when the algorithm is translated, usually by a human, to a computer language, the machine, the computer follows the instructions provided by the human via the algorithm (recipe) rewritten in language that the computer can understand. A computer, that is any automaton (robot) simply follows explicitly the instructions which are given to it. There is an essential difference between an automaton (say a computer) and a human. A computer cannot cope with ambiguity; it will refuse to proceed if there is more than one choice at any step, unless the human has specifically told the computer how to choose. Computers do not have the property of ‘choice’ . The reviewer calls this ‘choice’ free will, which I avoid because of the ambiguity of the word ‘free’. The cook, by contrast can cope with ambiguity and moreover, the cook can innovate which a computer cannot do. What then are computers good at. Computers can add and subtract numbers, they can determine if two numbers are equal, by subtracting one number from the other and looking to see if the result is 0. If it is 0, then the the two numbers are equal. If it is not 0, then the two numbers are not equal. In this way a computer can say whether some statement is true or false. This is rather limited. So why are computers so useful. It is because they can do the calculations very fast. Thus, computers are excellent in circumstances where the mass of data is large, too large to be digested by a human brain. I will take this opportunity to clarify one other scientific notion, namely entropy. The reviewer is of course correct, that living cells are possible because they have evolved mechanisms to deal with entropy. Living cells are possible because they take energy from their environment and use it to create organization in the interior of the cell. That is why there must be living CELLS. That is, there must be an active barrier between the inside and the outside of a cell. By extracting energy in complex substrates (compounds) from the environment and excreting simpler products at the end, cells increase the entropy of the environment. It is not possible to decrease entropy globally. The only possibility is to decrease entropy locally by increasing entropy to a greater extent in the environment. Perhaps, one might say that capitalism decreases entropy in its social organization, at the expense of a greater increase in entropy in its biological and physical environment.